The free 2016 Cost of Health Insurance report provides an in-depth overview of what an expat can expect to pay in 95 countries for individual international health insurance. 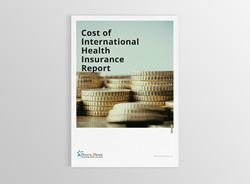 Pacific Prime has released the 2016 version of their annual free report that looks at the cost of individual international health insurance plans in 95 countries. Titled: Cost of Health Insurance Report - 2016 this report improves upon 2015's report while also providing an updated ranking of the top 20 most expensive and bottom five least expensive countries for medical insurance. This year's report compiles expat health insurance data from three levels of plans offered by ten insurers (who represent around 70% of international health insurance plans sold worldwide). Each of the three levels of plans have been priced for Singles, Couples, Families, and Retirees with the average price for each demographic ranked in the report's appendix section. The average cost of international private medical insurance in 2016 covers a range of USD 7,608 to USD 17,335. The US is, unsurprisingly, the most expensive location for International Health Insurance with an average cost of USD 17,335. Mali is this year's least expensive location with an average cost of USD 7,608. Dubai has seen the largest increase in ranking in the past year, coming in as the 6th most expensive location, up 8 places from 2015's ranking. Asia has some of the most expensive premiums on average, but other countries are closing the gap. The average price of insurance for four major demographics in 95 different locations. A number of countries increased in rank. There was a decrease in the percentage difference gap between the cost of insurance in the USA and the other locations when compared to 2015's rates. There was an overall decrease in the average cost of international insurance in the USA. The four major factors driving the cost of health insurance. The Cost of Health Insurance Report - 2016 is now available to download for free from Pacific Prime's Cost of Health Insurance website, with an online only, interactive regional analysis coming in the coming weeks. Visit our website today (http://www.pacificprime.com/cohi-2016/ ) to download the report.